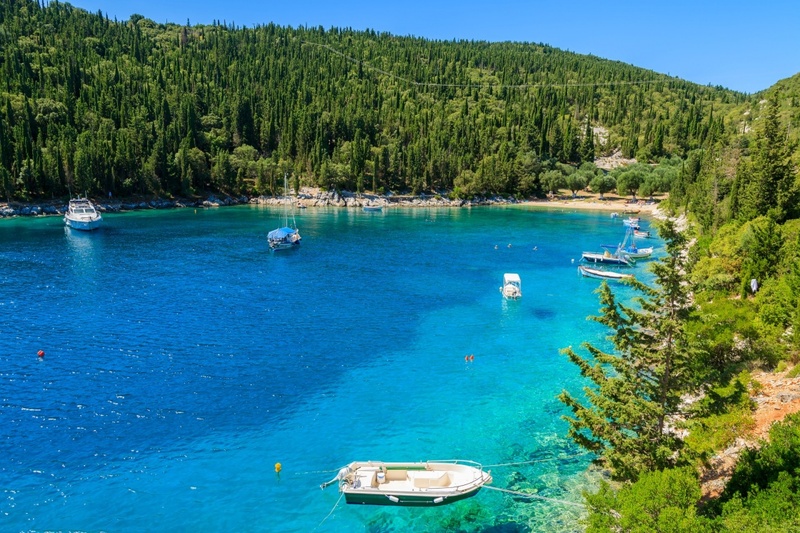 Kefalonia is a large, verdant island surrounded by the clean crystalline waters of the Ionian Sea and thus it would be strange if it didn’t have an impressive coastline. No matter what your preferences are, on Kefalonia you will find all sorts of beaches: from busy and well-organised to secluded and unspoilt ones. Long sandy beaches in the southern part, but white pebbled ones in the north. The scenery is always enchanting though, with dominating white cliffs covered with lush vegetation, spectacular views and romantic sunsets. The most famous beach and the registered trademark of the island is Mirtos beach, 30 kilometres away from Argostoli, the capital of Kefalonia. Its semi-circular shape with the surrounding hills is distinct and found on many postcards of the island of Kefalonia. It isn’t a sandy beach, instead it’s covered with beautiful white little pebbles making a strong contrast with the turquoise waters of the sea. There is an organised part with sun loungers and a snack bar, but overall it remains quite unspoilt. Despite the surrounding cliffs, there might be strong winds blowing here and the sea current tends to become stronger in the afternoons. 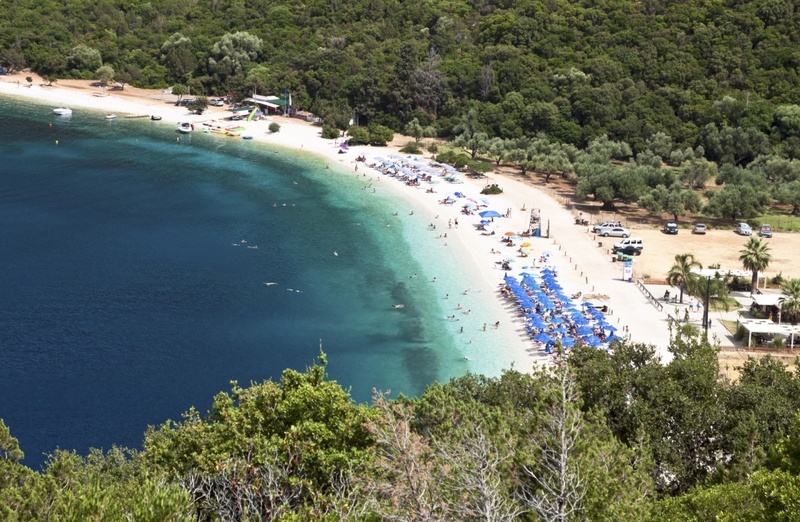 A beach with ideal conditions for swimming and equally stunning and popular with Myrtos is the Antisamos beach. The scenery is quite similar as it is surrounded by the mount Avgo – meaning egg- and is covered with white pebbles. It got popularised because some of the scenes of the film Captain Corelli’s Mandolin were filmed here. It is easily accessible from the coastal road in Sami and it’s 27 kilometres away from Argostoli. From here you can enjoy the view of the neighbouring island of Ithaca. Not suitable for children though as the water is extremely deep! 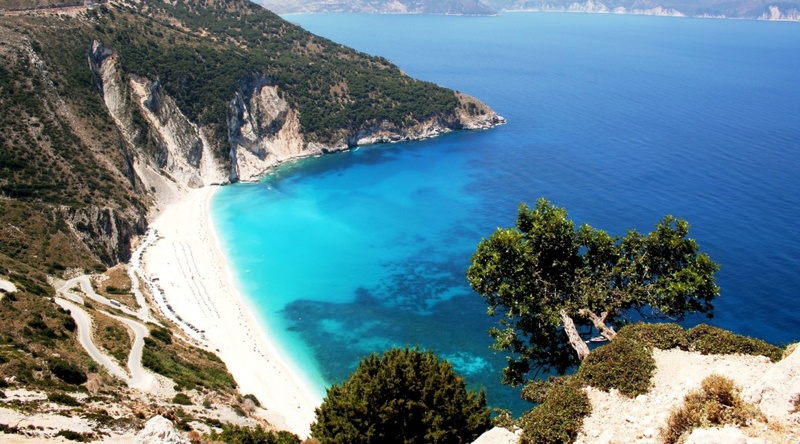 Emblisi is one of the most beautiful beaches on Kefalonia, very close to the village of Fiscardo. It is again one of the pebbled beaches of the island and the scattered white rocks which make the scenery even more tropical are ideal for sunbathing. Even though there are no tourist facilities, it can get quite busy due to its close proximity to Fiscardo and the easy access. Foki is another beach near Fiscardo, which is actually in a walking distance from it. It got its name from the Mediterranean monk seals (Fokia in Greek) who enjoy the waters here. If you are lucky enough, you might come across one of them while you are swimming! It is safe for swimming because of its relatively swallow waters and that is the reason why it is favoured by families. It is also quite small and it might feel a bit crowded, but it is definitely worth visiting and diving into the sea from the flat rocks found here. Of the sandy beaches of the island, Skala and Lourdas are among the best. The first one is a long beach near Mounda bay and it has been awarded with a blue flag many times. If you are into snorkelling, here you can admire the stunning underwater life of the Mediterranean. You can also have boat trips to nearby islets and small coves. The second one, Lourdas beach, is a well-organised beach surrounded by mount Aenos and its beautiful waterfalls. It is covered with white sand and two rows of sun loungers and umbrellas. There are a lot of restaurants, cafes, taverns and shops nearby and it is easily accessible by the local bus service from Argostoli and other villages. Last but not least it’s the beach of Xi – pronounced ksi. 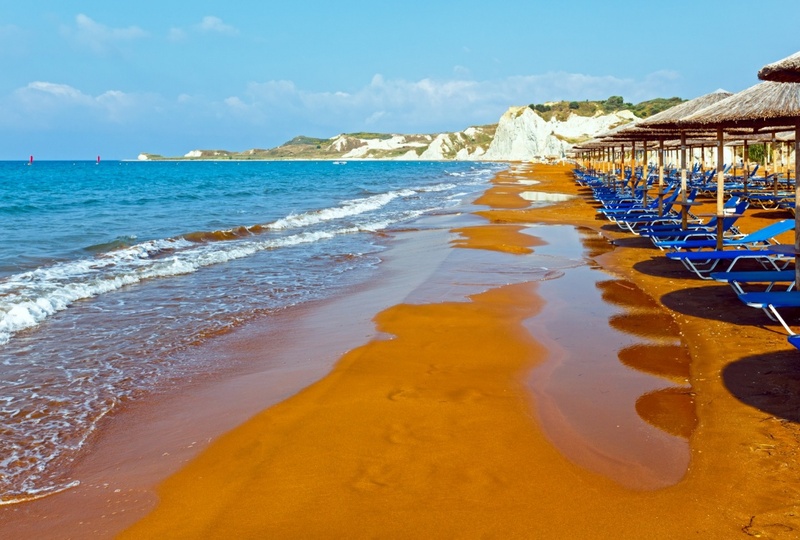 It is a sandy beach, but what distinguishes it from the rest of the sandy beaches on the island is the reddish colour of the sand. The sand is rich in clay which gives this special colour to it. It is said that sunbathing here is like having a natural spa, since clay is good for peeling and tightening the skin. It is relatively organised with a few facilities and is good for water sports. You will be able to find secluded spots though as it is very long. Other popular beaches near Argostoli are the Makris Gialos and Platis Gialos beaches, which are connected and therefore you can either walk or swim from the one to the other. Minia are actually three beaches with different features and Kateleios is a protected area without any tourist facilities, ideal for long walks and fresh fish in the taverns of the village. If you have enough days to visit more beaches, then you might want to enjoy sunbathing and swimming in Ammes, Agios Helis, Ligia and the beach of Agios Thomas in Trafliata. In the southern part, there are the beaches Avithos, Trapezaki, Limenia, Makria Petra and Lazarus. There are also the beaches of Agia Efimia, Platia Ammos, Petanoi and Megas Lakos in the northern and western side of the island respectively. Kefalonia is a verdant island with interchangeable landscape and distinct beaches to offer unforgettable memories, spectacular views, lovely sunsets and refreshing swims in the crystal clear waters!Visit the beaches of Kefalonia to feel as if you were on many different islands! ©2019 - kefalonia.ws All Rights Reserved.